Scent by Design… The perfect gift for design lovers, fragrance fans and anyone wanting to amp up their atmosphere, Page Thirty-Three’s Essential Oil Burner possesses a refined science theme combined with a hint of nature. A great way to clear the air at the end of the day, if this sounds like the perfect gift for someone on your shopping list, don’t forget to include the Page Thirty Three Incense Burner Set into their Christmas stocking with a solid brass burner and Sandalwood Incense Sticks to accompaniment this beautiful home accessory. The Hauswitch Spell Kits are cute and thoughtful gifts for those who are flat-sharing and co-habiting. Thanks to a selection of home-decorating and wellbeing essentials, ranging from candles to crystals, these ‘spell kits’ help dispel negative energy and create a harmonious household. Depending on your giftee, choose between the Co+Habitate Kit and Ohm Spell Kit. Are you shopping for someone who has a green thumb? We think the School of Life Seeds of Virtue Notecards make a brilliant, gift – in it you’ll find a perfectly packaged selection of greeting cards and packets of seeds, flowers or herbs. The notecards are designed to give (the recipient) a little nudge to cultivate and develop positive qualities and as the plants bloom, they give a daily prompt to revisit corresponding qualities and grow alongside them. Decorative and thoughtful – we approve! The Mood Mists… Great for taking the edge off in times of emotional unrest, we love our aromatherapy mists and always make sure to have one on hand, whether that be in our desk drawer, by our bedsides or in our handbags to resort to if we feel in need. We love the Hauswitch Spell Sprays, which are compact spray versions of the Spell Kits – full of aromatherapy and good vibes! Try the the Ohm Spell Spray and Hauswarming Spell Spray for increasing harmony with friends, lovers and roommates under your roof. If you’re buying a gift for someone new to mists, we’d recommend the Lotus Wei Mini Energy Mist Collection. Featuring mini’s of all six of the mists in the range to summon joy, create inner peace, inspire, energise, awaken feelings of love and affection and quieten the mind. These are especially great if your giftee is a frequent traveller – we always spritz our hotel rooms when we’re away. Perfect for those in need of an energy boost Therapie Roques O’Neil Restore Aura Spray, is another firm favourite when it comes to livening up our home environments and office. The captivating olfactory nuances of their Pure Candle has been designed to heal the environment and create tranquility. The Unwinding Light… If you know someone who is overworked or can’t seem to shake off stress, encourage him/her to develop their own evening ritual to unwind (this is our nightly non-negotiable!). When it comes to our routine, we like to make our environment as comfortable and welcoming as possible and we think there’s no better way to do this than with candles! 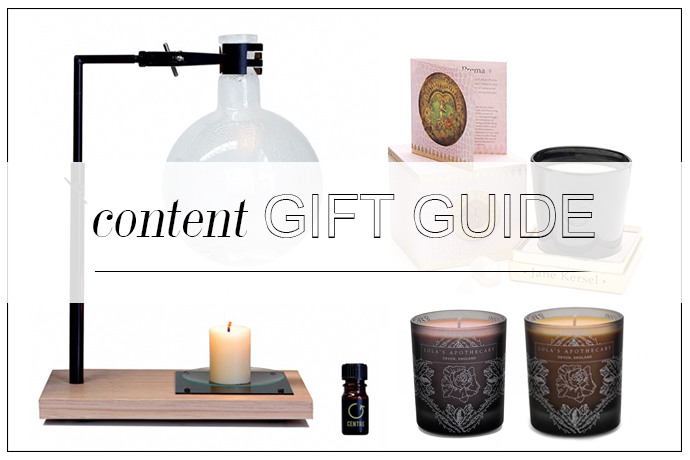 If you think your giftee would prefer some structure when it comes to their evening ritual, Jane Kersel’s Tantrika Candle makes for the perfect companion. Featuring a particular energetic emphasis, an audio meditation practise (on Jane’s website) and semi-precious crystals hand-picked to enhance the vibrational response of each candle, these alone provide a ritual great for those just starting a meditation practise and in need of a guiding light. Other #ContentApproved natural candles that are great for ambience, and also for a relaxing bathing ritual, are from Lola’s Apothecary: the Delicate Romance Natural Candle is a sumptuously feminine scent: great for a girly dinner or a romantic night in. Meanwhile, the Orange Patisserie Natural Candle smells like a drizzle cake bursting with bright citruses and warm spices – scrummy. It’s the perfect backdrop to the holiday season! Both candles also come in mini sizes, which make crowd-pleasing stocking fillers.